To check transconductance accuracy I built the Alternating Current Sink (ACS) test device detailed in the paper "Calibration Principles - Hickok Transconductance Testers TV-10, TV-7" written by Dr. H. Holden on the worldphaco.com website (just look for the Hickok TV-10 link on the site). It's a simple circuit, consisting of only two power transistors and some resistors, but provides a calibrated current source for checking transconductance accuracy. It's a clever little device and it also works fine in my TV-3C/U tester. I don't have time right now to make the printed circuit boards shown in the paper so I built my ACS on prototyping board. I found a couple of 800V power transistors (originally made for TV vertical deflection circuits) in one of my parts bins and the only other parts needed are the resistors and an octal tube base. 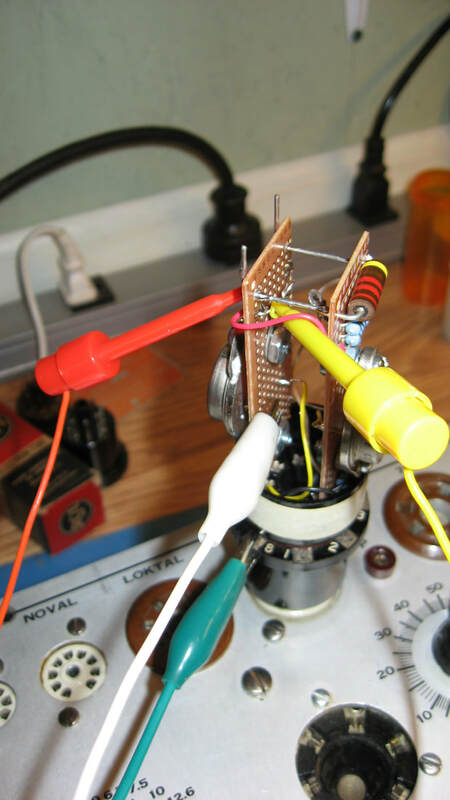 In the photo the ACS is being calibrated by measuring the voltage across a precision resistor in one leg of the circuit and using that measurement to calculate what the voltage in the second leg should be. 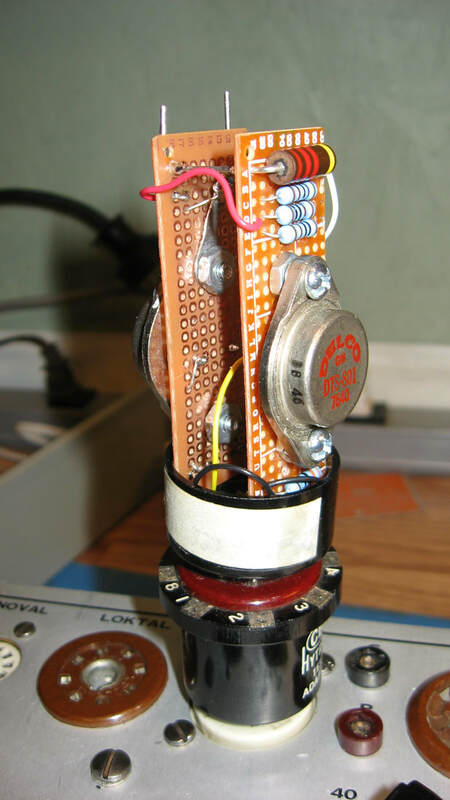 Then the emitter resistor in the second leg is adjusted to calibrate the unit. The whole procedure is detailed in the paper but what's really slick about the ACS is it can be calibrated in the tube tester using only a digital voltmeter. In use the ACS plugs into the octal socket of the tube tester which is set up as if testing a 6J5, except the filament is set to 10V. The ACS is designed to give a reading of 1000 umhos as read on the B scale when the tester is set to the B, D or E ranges. On the C range the reading will be 500 umhos also read on the B scale. At left is a photo of my ACS without all the clip leads used during calibration. After calibrating it I used it to check the calibration of my TV-3C tester and now I can use the calibrated TV-3C to compare test results with other tube testers I restore. Since the calibration of the ACS is only as accurate as the DVM used, I purchased a small precision voltage source from eBay just to verify my DVM's calibration. It was inexpensive and I've used it to check all my meters. This model outputs 2.5V, 5.0V, 7.5V and 10V at the push of a button. The calibration data is on a sticker on the bottom and is accurate to more digits than my meter can measure.